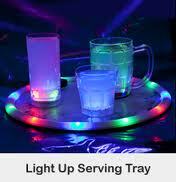 LED round trays for serving food and beverages add light up style to your service! The light up trays have a rubber liner to help prevent spillage. The trays are light weight, for easy carrying. LED round trays have a dazzling parade of bright LED lights steadily shining around their outer rim. These lights will help attract thirsty patrons to you or serve as an ultra beautiful cocktail tray for house partie. LED trays is a perfect accesory for your bar, clab,private party, wedding.